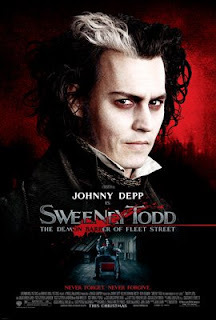 With the exams over, i was really looking forward to watching some movies with my friends… and so got the chance to catch Johnny Depp’s latest flick- Sweeney Todd which has been sub-titled as Demon Barber of Fleet Street. The film appealed to me right from the first frame. Based on Stephen Sondheim’s book by the same name, the film depicts London in its charm of the 19th century. The dark cinematography and musical was awesome, to start with. Depp (Benjamin Barker) plays a barber who has returned from serving a 15 year term after a lawyer caught him in a false case, so that he could take make Depp’s wife his’. The movie begins with Depp arriving back to London with a young man. He returns with nothing but thoughts of vengeance and revenge in his hate-filled mind. The dialogs are mostly sung in a poetic rhythm in which adds to the chill of the movie. In London he meets Mrs. Lovett, who knew his wife and tells him that she poisoned herself to death. In a fit of rage and wanting revenge against the cruel world, he starts a barber shop above Mrs. Lovett’s dead Pie Shop, changes his name to Sweeney Todd and kills people who come for a shave. He sends their bodies down to Mrs. Lovett’s pie-shop, where their bodies and minced and the meat is used to make meat pies which are a rage among an unsuspecting London crowd. The musical of the movie is simply awesome and Depp’s performance has just one word- Perfect! With his cold looks and baritone , he is the backbone of the movie. His performance is well supported by Helena Bonham Carter (Mrs. Lovett). The movie is monstrously funny at times and a perfect ballod at others. In all, this is probably one of the best movies of the year so far. Tim Burton (Director) has really done a great job and the portrayal of blood is done brilliantly. A must watch for people who like not-so-good-endings. I would give it 7/10. I’m Varun, a 17 year old from Delhi. Like sports, music, reading and playing football. Currently studying in the 12th grade and hoping to do well and complete my higher studies in the Economics or Engineering streams. I play football with my club 56 FC and support Arsenal FC with all my might. I guess that’s it about me. Hope you enjoy reading my blog and feel free to leave your comments on what I post! Cheers!